Hambrick was born on Wednesday, February 17, 1943, in New Orleans. In the Akan culture of West Africa, it is said, “Wednesday’s child is fully in control of every situation and does not want to be told what to do”. Ironically, Harold’s childhood nickname was “Bull,” a name affectionately used throughout his life. He grew up in the small water-town of Slidell, Louisiana on the north shore of Lake Pontchatrain. He was the eldest son of the late Harold Hambrick Sr. and Mary Ellen Clark Hambrick. Hambrick and his brothers worked with their father to build Slidell, La.’s first eight-unit apartment building in the 1950s. Harold was also an excellent student; Salutatorian and President of his senior class, and star quarterback for the Wildcats at St. Tammany High School in 1961. He won second place in physics in Louisiana and was Boys State representative for St. Tammany Parish. He even had his own account at Neuheuser’s Men’s Store at the age of fifteen. According to his cousin Annesther, he was always trying to organize something. Harold arrived in Los Angeles in the summer of 1961, where he enrolled at the Woodbury Institute. He matriculated to Los Angeles City College, attended UCLA, and later received his baccalaureate degree from Pepperdine University. Harold reached the door to the “promised land,” as did many other African Americans from the south, who moved west seeking better opportunities. Harold also found his place as an advocate for the poor as a soldier on the battlefield for equal opportunities for the less fortunate. The family believes that Harold Jr.’s interest in community service came from his exposure to the civil rights movement at Victory Baptist Church where his uncle, The Rev. Arthur Atlas Peters, was the founding minister. Victory was Harold’s first church home in Los Angeles and he made sure that the family had front row seats when the Reverends Martin Luther King, Sr. and Jr. came to town. Later, Harold was a founder of the Greater Liberty Baptist Church, pastored by the late Scholastic T. Peters. As a member of Ward A.M.E. Church, under the leadership of Dr. Frank M. Reid, III, Harold was a founder of the Band of Men. During the era of affirmative action, Harold availed himself of every employment opportunity that came his way. His first job was at the Hall of Patriots working on voter registration with the County of Los Angeles. He became the Controller for Jefferson High School before receiving an administrative internship at IBM. In 1967, Harold joined the South Central Multi Purpose Health Service Center, which later became Watts Health Foundation (WHF). He served in several capacities, including Vice President of Public Affairs. Hambrick is widely known for over 40 years of influential advocacy for healthcare access for residents of low-income communities. He traveled locally and nationally to address governmental agencies and legislative bodies regarding the plight of the underserved. He was active in the California Black Health Network, and served on the Community Advisory Council at Charles R. Drew University of Medicine and Science. Hambrick founded the Western Association of Community Health Centers and the California Community Health Institute. He was also co-founder of the Health Care Coalition for the Truly Needy and belonged to the National Association of Health Management Organizations. In addition to his work in community health, Hambrick was immersed in “all things Watts.” Arriving in Los Angeles when community-based organizations flourished and Watts was the center of activism and cultural pride, Harold became a part of the community’s energy, spirit, and in later years, its revitalization. He was a strong promoter of the Watts Summer Festival and increased the profiles of the Watts Christmas Parade and the Watts Martin Luther King Breakfast. Harold previously served as President of the Watts United Credit Union and was instrumental in the rebirth of the Watts Neighborhood Center (Mfundi Institute). The week before his quietus, he danced a “Second Line” at the Watts Tower’s Arts Festival. One of his proudest achievements was his involvement in the re-birth of the Watts Coffee House. Through his relationship with WHF and his vision for a sit-down restaurant for the residents, Harold was instrumental in reopening a community restaurant that had fallen victim to civic unrest in 1965. Since reopening in 1997 at the previous site of the Relish House, the restaurant is a hub of activity, with Desiree E. Edwards as Chef and Manager. His further vision was realized when the restaurant became a training site leading to advancement in the restaurant and food service industries. Harold Hambrick Jr.’s next venture began when he became president of the Los Angeles Black Business Expo, the second largest African American-focused consumer show in the country. He took pride in showing off the history and accomplishments of the community’s Black-owned businesses, and promoted the show to introduce young people to entrepreneurship. Harold enjoyed talking to young people and encouraged them to follow their dreams as he gave them an opportunity to market their businesses. This massive effort was the first Black consumer show held in the Tom Bradley Hall of the Los Angeles Convention Center, and in the late 1990s and early 2000s, included up to 400 vendors. Hambrick’s work was driven by the word “family,” which included the entire African American family, through the power of “connectedness.” He wanted young people to understand the history of Black entrepreneurship. He provided a network for future exchanges. He promoted each business, wanting young people to benefit from the exposure. He offered workshops at signature events such as the Tom Bradley Business Institute and the Youth Summit. When he wanted to implement a plan or discuss a critical issue, Harold Hambrick never waivered in his knowledge of who to call, and his assertiveness to do so, convening meetings with California’s Governor and the publishers of California’s African American newspapers. His father, Harold Sr., introduced him to business and entrepreneurship. Harold Jr. was vice president of the Board for Hambrick’s Family Mortuary, started by his dad in 1975. The business remains in full operation with younger brother, Darryl, as the CEO. Harold’s closest companion and brother, George, owns two technical services companies in Southern California, and brother Donald serves as legal counsel for the family’s businesses. Harold also owned an income tax service for more than 30 years, was a business partner with his siblings in Hambonz Piano Room, in Donaldsonville, and co-founder of the nationally recognized River Road African American Museum with his sister, Kathe. Always one to celebrate his Louisiana history and culture, Harold was a founder of LALA (Louisiana to Los Angeles Organizing Committee Inc.) in 1988. In addition to being on its Board of Directors, he often served as the Master of Ceremonies for the annual Mardi Gras Scholarship Ball, serving as LALA King in 2005. He was proud to sport the traditional regalia for the “Second Line” and maintained an enviable collection of New Orleans memorabilia that included Mardi Gras Indian costumes and a Zulu headdress. 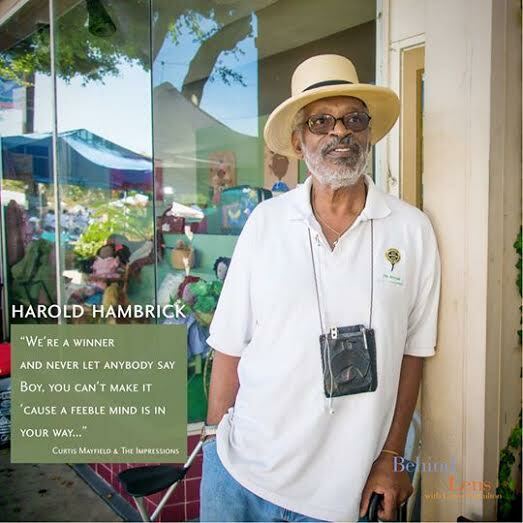 As the consummate visionary, Harold developed a National Black Heritage Trail, which he saw as way to bring families together on educational field trips across America. Harold was a genuine soul…NO DOUBT! He was put on this Earth to serve humanity. He loved the LORD, his family, and his community. Los Angeles and Donaldsonville will not ever be the same. Harold Hambrick Jr will be missed.